As the Fall 2016 semester came to an end, it was time to celebrate by having an epic sushi dinner with the TAs who shared the office with me. By virtue of SFU not really having enough TA offices, I had quite a few companions for this adventure: Ashton, Gaby, Jeff, Raymon, Sean, and Vy. Ashton, Jeff, and I were at an escape room that afternoon, and Ashton thought it would be a splendid idea for the three of us to have bubble tea right before dinner. How could I say "no" to bubble tea? Needless to say, I ended up marching into Sushi UOmo splendidly half full. 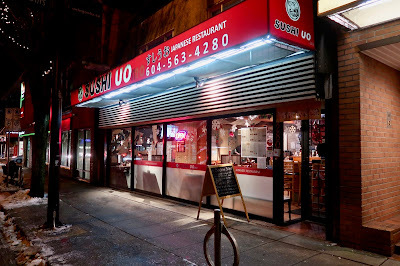 My first encounter with Sushi UOmo was in Episode #4 when it was the new kid on the block (nearly two and a half years ago), and lots of things have changed since then. The restaurant has become extremely popular, the quality has gone up, and the menu had been expanded. 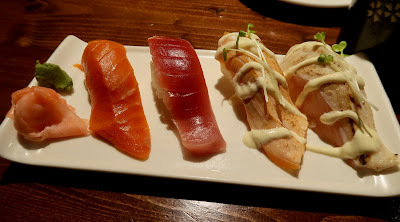 It has become the one restaurant I would recommend for budget sushi in North Burnaby. The servers were quick to provide us with complimentary bowls of miso soup. 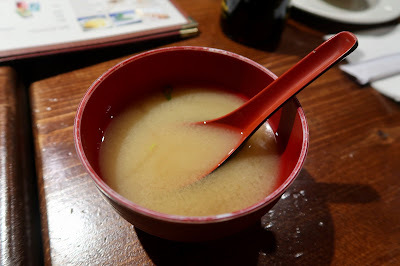 In fact, they were so quick that my miso soup arrived at my table before I even got to the restaurant. You can't really beat that! It was slightly on the saltier side, but that was mostly balanced out by a good amount of miso paste, some tofu, and some green onion. Next, Gaby and I shared the Drunken Tiger Roll, which consisted of crab meat, avocado, cucumber, boiled prawn (ebi), unagi, BBQ sauce, and wasabi mayo. 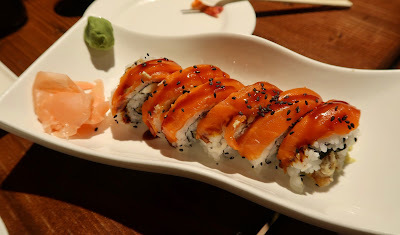 Overall, this roll had an enjoyable soft texture, and the flavours went together well. 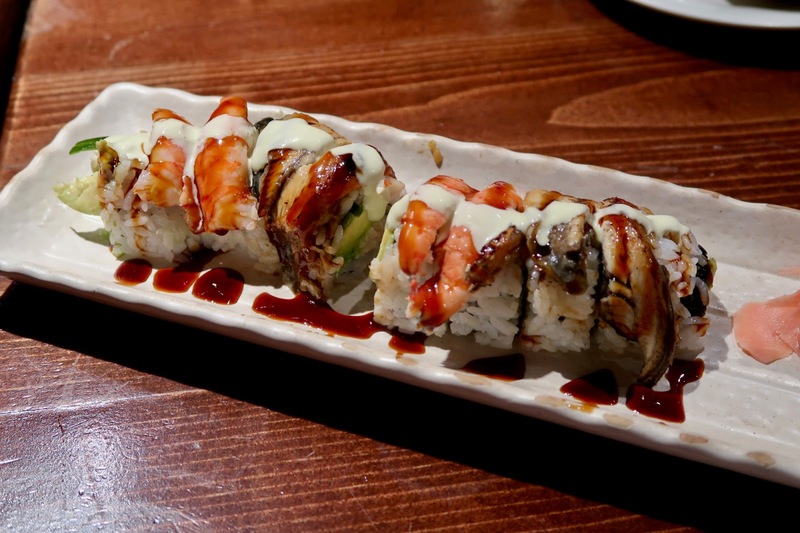 Soft, sweet unagi topped the roll, and the wasabi mayo was mild and unobtrusive. Unfortunately, I did not end up drunk, much to the disappointment of those at my table. The Sockeye Salmon Nigiri came with a generous piece of fresh salmon, though the rice was slightly bland and too tightly packed. The server eagerly suggested the Red Tuna Nigiri (i.e. bluefin), so I gave it a try, and it had a rather rich flavour compared to the red tuna nigiri I've had at other places. The Aburi Salmon Nigiri was slightly too creamy and chewy, but the Aburi Toro Nigiri was delightfully juicy and much softer. After the nigiri came the Red Dragon Roll that Jeff and I decided to split, and this roll came with wild salmon, unagi tempura, cream cheese, avocado, and BBQ sauce. This roll was another success. The cream cheese was melty and well-integrated into the roll. You could still feel the heat from the freshly made unagi tempura, whose light crispiness was an excellent complement to the soft, buttery wild salmon on top. 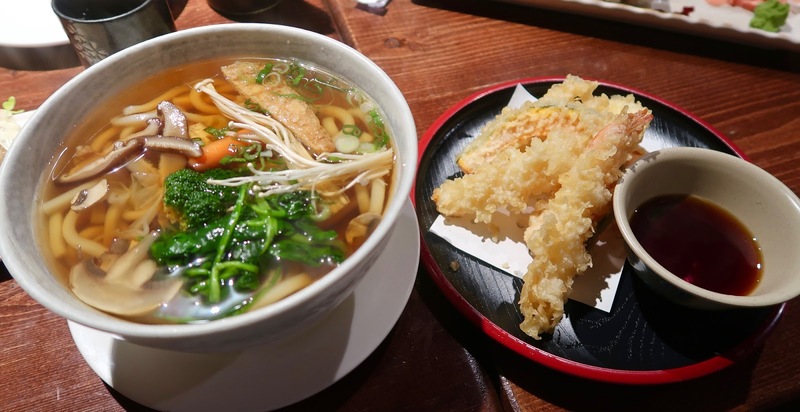 By this point, I was already near capacity and ended up having to stuff some of my Tempura Udon at Sean. The udon was accompanied by mushrooms, carrots, and various veggies and was nothing extraordinary. The batter on the tempura was on the thicker side, but it was crispy with sufficient moisture inside. Although they left out one of my items by mistake, the service was otherwise on point. I was actually somewhat glad about this since I was already very full. However, being very full was apparently not enough to stop me from spontaneously suggesting that we should have dessert afterward. That's one bubble tea and two large scoops of sorbet all in one evening, which I'm sure is totally healthy.